Patients from 211 centres in 27 countries with stage IIIB/IV recurrent NSCLC progressing after first-line chemotherapy, stratified by ECOG performance status, previous bevacizumab treatment, histology, and presence of brain metastases, were allocated (by computer-generated sequence through an interactive third-party system, in 1:1 ratio), to receive docetaxel 75 mg/m 2 by intravenous infusion on day 1 plus either nintedanib 200 mg orally twice daily or matching placebo on days 2–21, every 3 weeks until unacceptable adverse events or disease progression. Investigators and patients were masked to assignment. The primary endpoint was progression-free survival (PFS) by independent central review, analysed by intention to treat after 714 events in all patients. The key secondary endpoint was overall survival, analysed by intention to treat after 1121 events had occurred, in a prespecified stepwise order: first in patients with adenocarcinoma who progressed within 9 months after start of first-line therapy, then in all patients with adenocarcinoma, then in all patients. This trial is registered with ClinicalTrials.gov , number NCT00805194 . Between Dec 23, 2008, and Feb 9, 2011, 655 patients were randomly assigned to receive docetaxel plus nintedanib and 659 to receive docetaxel plus placebo. The primary analysis was done after a median follow-up of 7·1 months (IQR 3·8–11·0). PFS was significantly improved in the docetaxel plus nintedanib group compared with the docetaxel plus placebo group (median 3·4 months [95% CI 2·9–3·9] vs 2·7 months [2·6–2·8]; hazard ratio [HR] 0·79 [95% CI 0·68–0·92], p=0·0019). After a median follow-up of 31·7 months (IQR 27·8–36·1), overall survival was significantly improved for patients with adenocarcinoma histology who progressed within 9 months after start of first-line treatment in the docetaxel plus nintedanib group (206 patients) compared with those in the docetaxel plus placebo group (199 patients; median 10·9 months [95% CI 8·5–12·6] vs 7·9 months [6·7–9·1]; HR 0·75 [95% CI 0·60–0·92], p=0·0073). Similar results were noted for all patients with adenocarcinoma histology (322 patients in the docetaxel plus nintedanib group and 336 in the docetaxel plus placebo group; median overall survival 12·6 months [95% CI 10·6–15·1] vs 10·3 months [95% CI 8·6–12·2]; HR 0·83 [95% CI 0·70–0·99], p=0·0359), but not in the total study population (median 10·1 months [95% CI 8·8–11·2] vs 9·1 months [8·4–10·4]; HR 0·94, 95% CI 0·83–1·05, p=0·2720). Grade 3 or worse adverse events that were more common in the docetaxel plus nintedanib group than in the docetaxel plus placebo group were diarrhoea (43 [6·6%] of 652 vs 17 [2·6%] of 655), reversible increases in alanine aminotransferase (51 [7·8%] vs six [0·9%]), and reversible increases in aspartate aminotransferase (22 [3·4%] vs three [0·5%]). 35 patients in the docetaxel plus nintedanib group and 25 in the docetaxel plus placebo group died of adverse events possibly unrelated to disease progression; the most common of these events were sepsis (five with docetaxel plus nintedanib vs one with docetaxel plus placebo), pneumonia (two vs seven), respiratory failure (four vs none), and pulmonary embolism (none vs three). As part of efforts to further improve treatment for patients with advanced NSCLC, more than 15 large randomised phase 3 studies have been done in the past 10 years, but only the BR21 4 and TAX317 5 trials have shown an improvement in overall survival. Several studies of new agents have failed to show significant improvement in overall survival in the second-line setting ( appendix pp 7–9 ). Therefore, there is still a high unmet need for new effective second-line treatments for patients with NSCLC. 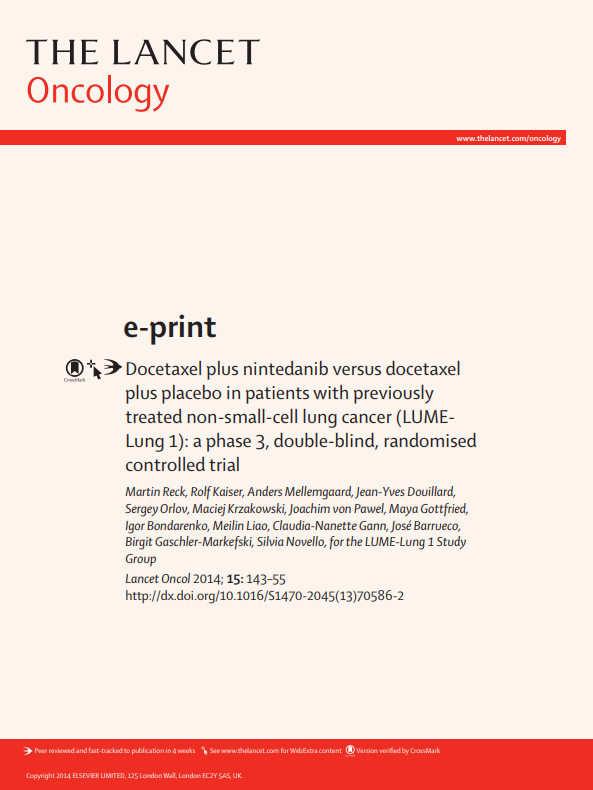 We present the results of the LUME-Lung 1 study, a phase 3 trial that assessed the efficacy and safety of the combination of nintedanib and docetaxel in patients with advanced NSCLC progressing after first-line chemotherapy. We did this study at 211 centres in 27 countries (23 European countries, China, South Korea, India, and South Africa). Adult (≥18 years) patients with histologically or cytologically confirmed stage IIIB/IV recurrent NSCLC (all histologies) who had received one previous chemotherapy regimen were enrolled. Only patients with relapse or failure of one previous first-line chemotherapy regimen were allowed to enter the study. In the case of recurrent disease one additional previous regimen was allowed for adjuvant, neoadjuvant, or neoadjuvant plus adjuvant therapy. Eligibility criteria included Eastern Cooperative Oncology Group (ECOG) performance status of 0 or 1 and at least one target lesion measurable according to Response Evaluation Criteria in Solid Tumors (RECIST) version 1.0. 13 Patients with active brain metastases (defined as stable for <4 weeks, no adequate previous treatment with radiotherapy, symptomatic, or requiring treatment with anticonvulsants), were excluded, as were those who had received previous docetaxel or VEGFR inhibitors with the exception of bevacizumab. Patients with radiographic evidence of cavitary or necrotic tumours, centrally located tumours with radiographic evidence (CT or MRI) of local invasion of major blood vessels, or a recent history (<3 months) of clinically significant haemoptysis or a major thrombotic or clinically relevant major bleeding event in the past 6 months were also excluded from the study. Detailed eligibility criteria are in appendix pp 11–12 . All patients provided written informed consent. The study complied with the protocol and Declaration of Helsinki, and was done in accordance with good clinical practice or regulatory guidelines and relevant local legislation. The protocol was approved by independent ethics committees or institutional review boards at each centre. An independent data monitoring committee was responsible for periodic assessment (about every 4 months and as necessary) of safety and efficacy data in the study. Patients were randomised in a 1:1 ratio to docetaxel plus nintedanib or docetaxel plus placebo. Patients were stratified by ECOG performance status (0 vs 1), previous bevacizumab treatment (yes vs no), histology (squamous vs non-squamous), and presence of brain metastases (yes vs no). Treatment was assigned by an interactive third-party telephone via an interactive voice response system, or web-based randomisation via interactive web-based response system. Randomisation was done in blocks per country for administrative reasons. “Country” was not predefined as a stratification factor for the primary analysis. The randomisation lists were provided by a completely separate group within the sponsor, the Clinical Trial Support Group, using a validated randomisation number generating system. Patients and investigators were masked to assignment, and none of the individuals directly involved in the conduct and analysis of the study had access to treatment allocation before the final database lock. Appendix p 3 provides details of circumstances that required data unmasking before final database lock. Patients were assigned to docetaxel 75 mg/m 2 by intravenous infusion on day 1 plus nintedanib 200 mg twice daily orally or matching placebo on days 2–21, every 3 weeks. Treatment was continued until unacceptable adverse events or disease progression. Patients were comedicated with oral corticosteroids for 3 days, starting the day before docetaxel infusion. In case of related adverse events up to two nintedanib dose reductions were permitted, first to 150 mg twice daily and then to 100 mg twice daily. Docetaxel dose reductions were allowed according to label recommendations ( appendix p 12 ). Patients who had to discontinue combination therapy because of docetaxel-related adverse events were allowed to continue nintedanib or placebo monotherapy if they had completed at least four cycles of combination therapy. Patients with unacceptable nintedanib-related adverse events were permitted to continue standard-dose docetaxel monotherapy. Target lesions were assessed by central independent review using modified RECIST, 13 at baseline (within 4 weeks of randomisation) and every 6 weeks after the first administration of docetaxel. Adverse events, classified according to Common Terminology Criteria for Adverse Events version 3.0, were recorded during the study period and follow-up. A serious adverse event was defined as any adverse event that resulted in death, was immediately life-threatening, resulted in persistent or significant disability or incapacity, needed admission to hospital or prolonged admission to hospital, or was a congenital anomaly or birth defect. Other events were deemed serious if, on the basis of appropriate medical judgment, the event might jeopardise the patient and need medical or surgical intervention to prevent one of the other outcomes listed in the above definition. Patients were monitored for adverse events throughout the study according to the visit schedule defined in the protocol. Patients were assessed for adverse events on a weekly basis during the first cycle, thereafter on the day of docetaxel administration, the week after docetaxel administration, and on demand. In case of an adverse event, patients were monitored more closely until they recovered. Blood samples were taken for laboratory analyses on a weekly basis throughout the first cycle; thereafter, at day of administration of docetaxel and the week after docetaxel administration. For patients assigned to nintedanib monotherapy, safety laboratory tests were only done in case of abnormal laboratory values. The primary endpoint was progression-free survival (PFS; defined as time from randomisation to progression or death) by central independent review. Overall survival was predefined as a key secondary outcome; other secondary outcomes were investigator-assessed PFS, tumour response by central review and investigator assessment, safety, and tolerability ( appendix p 5 ). Patient-reported quality of life, clinical improvement, and pharmacokinetics of nintedanib were also secondary endpoints; these results are being analysed and will be reported separately. Assuming a median overall survival of 9 months in the control group, 5 about 29 months of recruitment (45–60 patients per month), and 10% loss to follow-up, 1300 patients were to be randomised. The primary endpoint of independently assessed PFS was analysed on an intention-to-treat basis. A stratified log-rank test was used for the primary efficacy analysis at a two-sided 5% level of significance, in all randomised patients. 713 PFS events were needed for the primary analysis, as defined in the protocol, to detect an hazard ratio (HR) of 0·78 with 90% power. A preplanned futility analysis was to be done by the independent data monitoring committee after 50% of the events for the primary PFS analysis had been identified (about 356 events; appendix p 3 provides further details of this futility analysis). For the final analysis of the prespecified key secondary endpoint of overall survival, 1151 deaths would provide 80% power to detect a HR of 0·85 with the use of a stratified log-rank test and a two-look Lan-DeMets group sequential design with an O'Brien-Fleming-type boundary 14 at a two-sided cumulative 5% level of significance. This analysis could also be done after 48 months and before the 1151 deaths had been accrued, as predefined in the protocol. At the time of the primary PFS analysis and final overall survival analysis, 423 and 1121 deaths, respectively, had occurred. To adjust for the interim analysis, the Lan-DeMets procedure described was applied and the final α level for testing of the final overall survival analysis was 0·04984. A hierarchical procedure was applied to control the type I error rate when analysing the secondary endpoint of overall survival. Formal statistical testing for overall survival was only allowed if the difference in the primary endpoint PFS was significant and confirmed with a PFS analysis at the time of final overall survival analysis. Overall survival was analysed on an intention-to-treat basis in a prespecified stepwise fixed-sequence order: first in patients with adenocarcinoma histology who progressed during or shortly after the end of their first-line treatment (defined as time elapsed since start of first-line therapy of less than 9 months until randomisation into the trial), 15 followed by all patients with adenocarcinoma histology and then in all patients independent of histology. The stepwise analyses of the prespecified key secondary endpoint of overall survival in the LUME-Lung 1 study were introduced prospectively before database lock for overall survival, but after the primary analysis for PFS had been done. The analyses were extended beyond the original specifications of the analysis plan to validate findings from a hypothesis-generating analysis of the LUME-Lung 2 study. 12 At that timepoint the LUME-Lung 1 data were still masked to investigators, patients, and the team involved in the study conduct; all patients in the LUME-Lung 1 study had already been randomised, and most were undergoing follow-up for overall survival ( appendix p 3 provides more details of the stepwise analysis). In this analysis, time from the start of first-line therapy was identified as the only prognostic and predictive clinical marker for the treatment effect of nintedanib in combination with pemetrexed in second-line treatment of patients with non-squamous-cell cancer. 11 12 15 Using a cutoff of less than 9 months of time elapsed since start of first-line therapy defined a population of patients with poor prognosis—ie, patients who had progressed during or shortly after first-line therapy. For both PFS and overall survival, time-to-event distribution was estimated using the Kaplan-Meier method. The HRs and corresponding 95% CIs were estimated using a stratified Cox proportional hazards model. HRs of less than 1 favour nintedanib. The p value for the stratified log-rank test was obtained from the score test. HRs and treatment interaction p values were produced to investigate the consistency of the treatment effect for predefined baseline characteristics. Appendix p 5 provides further details of the statistical analyses of the primary and secondary efficacy endpoints, including the preplanned sensitivity analyses and exploratory subgroup analyses. All other secondary efficacy endpoints were analysed by intention to treat. Safety data were analysed descriptively in all treated patients. Adverse events were also categorised into special search categories by pooling Medical Dictionary for Regulatory Activities preferred terms using standardised queries and individually tailored searches. Median follow-up time was calculated using the Kaplan-Meier estimator method proposed by Schemper and Smith with loss of follow-up treated as an event and death treated as a censored observation. 16 All statistical analyses were done using SAS (version 9.2). This trial is registered with ClinicalTrials.gov , number NCT00805194 . The study was jointly designed by academic investigators and representatives of the sponsor, Boehringer Ingelheim. Parexel, a clinical research organisation, was contracted to monitor the study and collect the data. The statistical analyses were done by the sponsor's statistical team (of which BG-M is a member). MR along with RK and BG-M, employees of the sponsor, contributed to the conception and design of the study. MR along with RK, C-NG, JB, and BG-M, employees of the sponsor, had access to the raw data and were involved in data analysis and data interpretation. MR and RK jointly prepared the initial draft of the report and contributed equally. All authors actively contributed to subsequent drafts and provided final approval to submit the report for publication. The corresponding author had full access to all the data in the study and final responsibility for the decision to submit for publication. Patients were enrolled between Dec 23, 2008 and Feb 9, 2011. Of the 1773 patients screened, 1314 were randomised (655 to docetaxel plus ninetedanib, 659 to docetaxel plus placebo) and comprised the intention-to-treat population ( figure 1 ). The main reason for exclusion after screening was the presence of newly detected brain metastases. Of the 1314 randomised patients, 1307 went on to receive at least one dose of study drug, and comprised the safety population ( figure 1 ). As of the data cutoff (Feb 15, 2013), six patients in the docetaxel plus nintedanib group and five in the docetaxel plus placebo group were still receiving treatment, either combination therapy (one patient per group) or nintedanib or placebo monotherapy (remaining patients). Demographics and baseline characteristics, including previous response to first-line therapy, were well balanced between the two treatment groups ( table 1 ). There were 658 patients with adenocarcinoma histology and 555 patients with squamous-cell carcinoma. For these major histologies, demographics and baseline characteristics, including the predefined stratification factors, were balanced across treatment groups (data not shown). *151 (41·7%) patients had active brain metastases; 82 (22·7%) had radiographic evidence of a cavitary or necrotic tumour, or a centrally located tumour, or both; 64 (17·7%) did not have at least one measurable lesion; 26 (7·2%) had increased alanine aminotransferase, increased aspartate aminotransferase, or increased bilirubin. †22 (50·0%) patients had imaging problems (no image, image not approved or delayed); 13 (29·5%) had administrative problems (screening period extended, too ill, died, or refused to participate); eight (18·2%) did not meet eligibility criteria; one (2·3%) was deemed non-eligible with one patient study number but was randomised with another number. ‡One patient had an adverse event (depression) with onset in the screening period that led to treatment discontinuation. This adverse event was not included in the safety analysis of treatment-emergent adverse events leading to discontinuation. Data are median (IQR) or n (%) unless otherwise specified. ECOG=Eastern Cooperative Oncology Group. UICC/AJCC=Union Internationale Contre le Cancer/American Joint Committee on Cancers (6th or 7th edition). * One patient receiving docetaxel plus nintedanib had an ECOG performance status of 2. † The 6th edition was used to stage 709 of 1314 patients (54·0%) and the 7th edition was used to stage 602/1314 patients (45·8%). ‡ Histological classification was missing for one patient receiving docetaxel plus placebo; however, at stratification via interactive voice response system it was indicated that this patient had squamous-cell carcinoma. § Tumour assessment by central independent review. ¶ Nine patients in the docetaxel plus nintedanib group and eight patients in the docetaxel plus placebo group did not receive first-line therapy. The median duration of treatment with nintedanib was 3·4 months (IQR 1·4–6·2) and with placebo was 2·8 months (1·4–5·4). The median number of docetaxel courses administered was four (IQR two to six) in both groups. The mean dose intensity of nintedanib was 92·09% (SD 15·41) and that of placebo was 94·91% (11·50). The mean dose intensity of docetaxel was 98·33% (SD 4·22) in the nintedanib group and 98·74% (3·71) in the placebo group. Median follow-up was 7·1 months (IQR 3·8–11·0) at the time at the primary PFS analysis and 31·7 months (27·8–36·1) at the time of the final overall survival analysis. PFS, as determined by central independent review, was significantly longer in the docetaxel plus nintedanib group than in the docetaxel plus placebo group (median PFS 3·4 months [95% CI 2·9–3·9] vs 2·7 months [2·6–2·8]; HR 0·79 [95% CI 0·68–0·92], p=0·0019; figure 2A ). Similar results were noted both in patients with adenocarcinoma and patients with squamous-cell carcinoma ( figure 2B, 2C ). The results of predefined sensitivity analyses were much the same as the results of the primary PFS analysis ( appendix p 13 ). The effect of nintedanib on PFS was also consistent in the prespecified subgroup analyses ( appendix p 21 ). The HR for PFS was 0·85 (95% CI 0·75–0·96, p=0·0070) at the time of the final overall survival analysis, which included all PFS events (1057 events) collected by that point. At the final analysis, median PFS in the total population of patients was 3·5 months (95% CI 3·0–4·0) in the docetaxel plus nintedanib group versus 2·7 months (2·6–2·8) in the docetaxel plus placebo group. (A) Total population. (B) Patients with adenocarcinoma histology. (C) Patients with squamous-cell carcinoma histology. Patients without documented disease progression or death were censored at the last tumour assessment. HR=hazard ratio. In the predefined population of patients with adenocarcinoma who had progressed within 9 months after start of first-line therapy, overall survival was significantly longer in the docetaxel plus nintedanib group than in the docetaxel plus placebo group (median overall survival 10·9 months [95% CI 8·5–12·6] vs 7·9 months [6·7–9·1]; HR 0·75 [95% CI 0·60–0·92], p=0·0073; figure 3A ). Notably, in this population of patients, median PFS was significantly longer in the docetaxel plus nintedanib group, both at the time of the primary PFS analysis (3·6 months [95% CI 2·8–4·3] vs 1·5 months [1·4–2·6]; HR 0·63 [95% CI 0·48–0·83], p=0·0008]) and at the time of the final overall survival analysis (4·2 months [95% CI 3·2–4·4] vs 1·5 months [1·4–2·6]; HR 0·68 [95% CI 0·54–0·84], p=0·0005). (A) Patients with adenocarcinoma histology and time since start of first-line therapy of less than 9 months. (B) All patients with adenocarcinoma histology. (C) Total population. Patients without documented death were censored at the date of last contact when the patient was known to be alive. HR=hazard ratio. In all patients with adenocarcinoma, overall survival was significantly longer in the docetaxel plus nintedanib group than in the docetaxel plus placebo group (median overall survival 12·6 months [95% CI 10·6–15·1] months vs 10·3 [95% CI 8·6–12·2] months; HR 0·83 [95% CI 0·70–0·99], p=0·0359); the Kaplan-Meier survival curves separate at 6 months, continuing throughout the 36-month study observation period ( figure 3B ). 1 year overall survival was 52·7% (95% CI 46·8–57·9) in the docetaxel plus nintedanib group compared with 44·7% (38·9–49·8) in the docetaxel plus placebo group; 2 year overall survival was 25·7% (95% CI 20·5–30·2) in the docetaxel plus nintedanib group compared with 19·1% (14·4–23·2) in the docetaxel plus placebo group. The effect of nintedanib on overall survival was consistent in most of the prespecified subgroup analyses of patients with adenocarcinoma histology ( figure 4B ). (A) Progression-free survival at time of primary analysis. (B) Overall survival at time of final analysis. Bubble size represents number of events. ECOG=Eastern Cooperative Oncology Group. CR=complete response. PR=partial response. SD=stable disease. PD=progressive disease. In the total population of patients (all histologies), there was no difference in overall survival between the two groups: median overall survival was 10·1 months (95% CI 8·8–11·2) in the docetaxel plus nintedanib group compared with 9·1 (8·4–10·4) months in the docetaxel plus placebo group (HR 0·94 [95% CI 0·83–1·05], p=0·2720; figure 3C ). After adjustment, as predefined in the protocol, for the prognostic factor of baseline sum of longest diameters of target lesions, 17 a difference in overall survival was noted (HR 0·88 [95% CI 0·78–0·99], p=0·0365; appendix p 13 ). The investigation of the interaction between treatment and this variable showed that greater tumour burden was associated with a greater treatment effect for docetaxel plus nintedanib. 18 No imbalance of this baseline variable between the groups was identified ( table 1 ). The effect of nintedanib on PFS and overall survival was consistent in most of the prespecified subgroup analyses of patients with adenocarcinoma histology ( figure 4 ) and for all patients ( appendix p 21 ). There was no difference in overall survival between the two groups for patients with squamous-cell carcinoma (HR 1·01 [95% CI 0·85–1·21], p=0·8907; appendix p 22 ). An exploratory analysis was done in the subset of adenocarcinoma patients most refractory to first-line treatment. These patients were reported by the investigators to have achieved no better than progressive disease in response to first-line therapy. In these 117 patients (53 in the docetaxel plus nintedanib group and 64 in the docetaxel plus placebo group), overall survival was longer in the docetaxel plus nintedanib group compared with the docetaxel plus placebo group (median overall survival 9·8 months [95% CI 6·1–15·5] vs 6·3 months [5·0–8·1]; HR 0·62 [95% CI 0·41–0·94], p=0·0246). The HR for PFS at the time of the final overall survival analysis was 0·67 (95% CI 0·43–1·04, p=0·0725) for this subgroup of patients; median PFS was 4·2 months (95% CI 2·8–4·5) in the docetaxel plus nintedanib group versus 1·6 months (95% CI 1·4–2·8) in the docetaxel plus placebo group. Subsequent anticancer treatments were balanced between both groups across all populations of patients; slightly fewer patients with squamous-cell carcinoma (265 of 555 [48%]) received follow-up anticancer drugs than did patients with adenocarcinoma (367 of 658 [56%]; appendix p 14 ). Investigator-assessed PFS results were much the same as those of the independent central review analysis ( appendix p 6 ). Objective responses by central review at the time of the final analysis were noted in much the same proportion of patients in the two groups for the overall study population (29 of 655 [4·4%] with docetaxel plus nintedanib vs 22 of 659 [3·3%] with docetaxel plus placebo; odds ratio [OR] 1·34 [95% CI 0·76–2·39], p=0·3067) and in patients with adenocarcinoma (15 of 322 [4·7%] vs 12 of 336 patients [3·6%]; OR 1·32 [95% CI 0·61–2·93], p=0·4770), but were more common in patients with adenocarcinoma and time since start of first-line therapy of less than 9 months in the docetaxel plus nintedanib group than in the docetaxel plus placebo group (ten of 206 [4·9%] vs three of 199 [1·5%]; OR 3·54, 95% CI 1·06–16·03, p=0·0393; table 2 ). Investigator-assessed tumour response results were much the same as those of the central review analysis ( appendix p 6 ). Disease control was more common in the docetaxel plus nintedanib group than in the docetaxel plus placebo group for all patients (354 of 655 [54·0%] vs 272 of 659 [41·3%]; OR 1·68 [95% CI 1·35–2·09], p<0·0001), in patients with adenocarcinoma (194 of 322 [60·2%] vs 148 of 336 [44·0%]; OR 1·93 [95% CI 1·42–2·64], p<0·0001), and in patients with adenocarcinoma and time since start of first-line therapy of less than 9 months (122 of 206 [59·2%] vs 66 of 199 [33·2%]; OR 2·90 [95% CI 1·94–4·38]; p=0·0009). Similarly, in patients with squamous-cell carcinoma, disease control was more common in the docetaxel plus nintedanib group than in the docetaxel plus placebo group (136 of 276 [49·3%] vs 99 of 279 [35·5%]; OR 1·78 [95% CI 1·26–2·51], p<0·0001), although the proportion of patients who achieved an objective response was much the same in both groups (13 of 276 [4·7%] vs seven of 279 patients [2·5%]; OR 1·93 [95% CI 0·78–5·20], p=0·1594; appendix p 15 ). By central independent review at the time of final overall survival analysis. * n=655 for docetaxel plus nintedanib; n=659 for docetaxel plus placebo. † Odds ratio (OR; by logistic regression adjusted for baseline Eastern Cooperative Oncology Group [ECOG] performance status) for disease control in overall population was 1·68 (95% CI 1·35–2·09); p<0·0001. ‡ Other includes patients with stable disease within 6 weeks and non-evaluable responses. § n=322 for docetaxel plus nintedanib; n=336 for docetaxel plus placebo. ¶ OR (by logistic regression adjusted for baseline ECOG performance status) for disease control in patients with adenocarcinoma was 1·93 (95% CI 1·42–2·64); p<0·0001. ‖ n=206 for docetaxel plus nintedanib; n=199 for docetaxel plus placebo. ** OR (by logistic regression adjusted for baseline ECOG performance status) for objective response in patients with adenocarcinoma and time since start of first-line therapy of less than 9 months was 3·54 (95% CI 1·06–16·03); p=0·0393. †† OR (by logistic regression adjusted for baseline ECOG performance status) for disease control in patients with adenocarcinoma and time since start of first-line therapy of less than 9 months was 2·90 (95% CI 1·94–4·38); p<0·0001. Docetaxel plus nintedanib also led to a significant decrease from baseline in tumour size of the target lesions in the total population of patients, in patients with adenocarcinoma, and in patients with adenocarcinoma and time since start of first-line treatment of less than 9 months ( appendix p 23 ). Adverse events that were more common (≥5% difference) in the docetaxel plus nintedanib group than the docetaxel plus placebo group were: diarrhoea (all grades, 276 of 652 [42·3%] vs 143 of 655 patients [21·8%]; grade ≥3, 43 [6·6%] vs 17 [2·6%]), increases in alanine aminotransferase (all grades, 186 [28·5%] vs 55 [8·4%]; grade ≥3, 51 [7·8%] vs six [0·9%]), nausea (all grades, 158 [24·2%] vs 118 [18·0%]; grade ≥3, five [0·8%] vs six [0·9%]), increases in aspartate aminotransferase (all grades, 147 [22·5%] vs 43 [6·6%]; grade ≥3, 22 [3·4%] vs three [0·5%]), decreased appetite (all grades, 145 [22·2%] vs 102 [15·6%]; grade ≥3, nine [1·4%] vs eight [1·2%]), and vomiting (all grades, 110 [16·9%] vs 61 [9·3%]; grade ≥3, five [0·8%] vs three [0·5%]; table 3 ). Most of these adverse events were manageable with supportive treatment or dose reduction. ALT=alanine aminotransferase. AST=aspartate aminotransferase. GGT=gamma-glutamyltransferase. * Reported as adverse events of all grades occurring in at least 10% of patients in either treatment group or adverse events of grade 3 or 4 occurring in more than 1% of patients. 121 of 650 (18·6%) patients in the docetaxel plus nintedanib group and 41 of 650 (6·3%) patients in the docetaxel plus placebo group needed at least one dose reduction of nintedanib or placebo. Docetaxel dose reductions were needed in 102 of 652 (15·6%) patients in the docetaxel plus nintedanib group and in 78 of 655 (11·9%) patients in the docetaxel plus placebo group. Haematological adverse events were the main reason for docetaxel dose reduction and gastrointestinal adverse events and increases in liver enzymes accounted for most of the nintedanib dose reductions. Increases in liver enzymes were reversible. 75 of 652 (11·5%) patients in the docetaxel plus nintedanib group had an adverse event of grade 3 or higher leading to dose reductions of nintedanib, compared with 26 of 655 (4·0%) patients in the docetaxel plus placebo group requiring dose reductions of placebo. Analyses of adverse events of special interest for adverse events commonly associated with antiangiogenic agents, such as hypertension, bleeding, and gastrointestinal perforation, were much the same in both groups ( appendix p 18 ). Adverse events led to permanent discontinuation of last study drug in 148 of 652 (22·7%) patients in the docetaxel plus nintedanib group and in 142 of 655 (21·7%) patients in the docetaxel plus placebo group. Adverse events leading to death related to disease progression occurred in 72 of 652 (11·0%) patients in the docetaxel plus nintedanib group and in 52 of 655 (7·9%) patients in the docetaxel plus placebo group. Adverse events leading to death possibly unrelated to disease progression were reported in 35 of 652 (5·4%) patients in the docetaxel plus nintedanib group and in 25 of 655 (3·8%) patients in the docetaxel plus placebo group. Fatal adverse events possibly unrelated to disease progression occurring in more than two patients in either group were sepsis (five patients in the docetaxel plus nintedanib group vs one patient in the docetaxel plus placebo group), pneumonia (two vs seven), respiratory failure (four vs none), and pulmonary embolism (none vs three; appendix pp 17–18 ). The safety profile of docetaxel plus nintedanib in patients with adenocarcinoma was much the same as that for the total study population ( appendix pp 21–22 ). Docetaxel plus nintedanib significantly improved PFS independently of histology in patients with advanced recurrent NSCLC who had progressed following first-line chemotherapy, and significantly prolonged overall survival of patients with adenocarcinoma, including patients with poor prognosis (ie, those who had progressed within 9 months of start of first-line therapy). Adverse events that were substantially more common in the docetaxel plus nintedanib group than the docetaxel plus placebo group were diarrhoea, increased alanine aminotransferase, and increased aspartate aminotransferase. 35 (5·4%) fatal adverse events possibly unrelated to disease progression occurred in the docetaxel plus nintedanib group compared with 25 (3·8%) in the docetaxel plus placebo group. More than 15 second-line phase 3 studies have been done in the past decade ( appendix pp 7–9 ). Taken together, except for the BR.21 trial 4 investigating erlotinib versus placebo and the TAX 317 trial 5 investigating docetaxel versus best supportive care, none of these studies have shown a significant improvement in overall survival, either for the total population of patients or for any of the major histological subtypes, such as adenocarcinoma or squamous-cell carcinoma. This lack of success includes studies of targeted agents in combination with standard second-line therapy, such as ZODIAC, 19 VITAL, 20 BETA, 21 and SUN1087 22 ( appendix pp 7–9 ). As far as we are aware, the present study is the first trial in the second-line setting combining a targeted agent with chemotherapy to show a survival benefit, with median overall survival surpassing 1 year in patients with adenocarcinoma NSCLC versus an active comparator ( panel ; appendix pp 7–9 ). The median overall survival for the docetaxel plus placebo group of 10·3 months in the adenocarcinoma population is much the same as that reported for patients in the docetaxel control group in the ZODIAC study (10 months), 19 VITAL study (10·4 months), 20 JMEI study (7·9 months), 23 or the TAX317 study (7·5 months). 5 Moreover, the post-study treatments in the two groups in the present study were balanced in the total study population, in the total adenocarcinoma population, in patients with adenocarcinoma and time since start of first-line treatment of less than 9 months ( appendix p 14 ), and in patients with squamous-cell carcinoma histology, suggesting that the recorded prolongation of median overall survival is attributable to a treatment effect of nintedanib in combination with docetaxel and not to an underperforming control group or to post-study treatments. EGFR biomarker testing was not standard clinical practice at the time that the study was done. The small group of Asian patients (18%) was similarly distributed between the groups and there was no imbalance of subsequent treatment with EGFR inhibitors between the groups. We searched PubMed using the keywords “NSCLC”, “adenocarcinoma”, “squamous-cell carcinoma”, and the clinically evaluated antiangiogenic compounds: “vandetanib”, “bevacizumab”, “sunitinib”, “sorafenib”, “motesanib”, “aflibercept”, “pazopanib”, “axitinib”, and “cediranib” to delineate which antiangiogenic compounds had been studied in NSCLC in either the first-line setting, second-line setting, or maintenance setting. We further examined second-line treatment by searching for the names of compounds currently registered for NSCLC in this setting (“docetaxel”, “pemetrexed”, “erlotinib”), which helped to confirm that there was a great unmet need for refractory patients with NSCLC. We did not find any available evidence suggesting that any therapy substantially extends overall survival versus an active comparator in patients with adenocarcinoma or squamous-cell carcinoma, or significantly improves PFS in patients with squamous-cell carcinoma. Encouraging preclinical and phase 1 and 2 clinical activity with nintedanib and a tolerability profile that favoured the combination with docetaxel and allowed the inclusion of patients with squamous-cell carcinoma provided further support to do this trial. Docetaxel plus nintedanib improved PFS for patients with refractory NSCLC compared with docetaxel plus placebo, irrespective of histological subtypes, and improved overall survival for patients with adenocarcinoma. The combination of nintedanib and docetaxel seems to be especially beneficial in adenocarcinoma patients with poor prognosis, for whom there is a high unmet need, such as patients with progressive disease in the first-line setting, or patients who progress within 9 months after the initiation of first-line therapy. In the present study there is evidence of efficacy of nintedanib in patients with adenocarcinoma with a poor prognosis who were either refractory to first-line therapy or had a response of very short duration. In these patients, who progressed within 9 months after starting first-line treatment, PFS was significantly longer in the docetaxel plus nintedanib group than in the docetaxel plus placebo group, which translated to an improvement in overall survival. Consistent with this finding, in patients with adenocarcinoma who had only progressive disease as best response to first-line therapy, there was a significant improvement in median overall survival. Up to now, only the TITAN trial 32 has been done in a similar population of rapidly progressing or platinum-refractory patients. In that study, however, erlotinib in comparison with chemotherapy (docetaxel or pemetrexed) did not improve PFS (6·3 vs 8·6 weeks with chemotherapy) or overall survival (5·3 vs 5·5 months). The assessment of outcomes in specific subgroups of patients suggests a better response from docetaxel plus nintedanib in the never-smoker population; however, despite these numerical differences, statistical analyses failed to show a significant interaction between smoking and treatment outcome, raising the possibility that this finding might be attributable to chance. The biological rationale underlying this difference is not known at this time, but from a pharmacological perspective, there was no evidence of substantial differences in pharmacokinetics or pharmacodynamics between the groups. Although objective response by central review for the total population did not differ between the two groups, significantly more patients with adenocarcinoma and with time since start of first-line therapy of less than 9 months achieved an objective response with docetaxel plus nintedanib than with docetaxel plus placebo. However, significantly more responses were not expected on the basis of the mechanism of action of nintedanib as compared with EGFR inhibitors in patients with EGFR activating mutations. Objective responses based on investigator assessment of imaging scans were noted in 68 (10·4%) of 655 patients with docetaxel plus nintedanib and 50 (7·6%) of 659 patients in the docetaxel plus placebo ( appendix p 6 ). These results are much the same as those reported in the JMEI 22 (8·8% in the docetaxel group) and the TAX317 5 studies (5·5% in the intention-to-treat population and 7·1% in evaluable patients). In addition to previously noted angiokinases (VEGFR1–3, FGFR1–3, PDGFR α and β), nintedanib also inhibits RET. Although the potential contribution of this mechanism has been considered, RET biomarker testing was not done in the present study. In the scientific literature, KIF5B-RET fusion has been reported in a small proportion (about 1%) of patients with adenocarcinoma NSCLC in both Asians and non-Asians. 33 34 It would be unlikely that this small fraction of patients would account for the treatment effect seen with nintedanib, but a potential contribution of this mode of action cannot be fully excluded. In future studies, it will be important to do correlative biomarker analyses and to try to identify the biological rationale underpinning the response to nintedanib in combination with docetaxel in NSCLC, in particular for patients with adenocarcinoma refractory to first-line therapy. The results in these patients might be correlated to the biology of rapidly progressing tumours. Such tumours might contain a large fraction of proliferating cells and need high levels of oxygen and nutrients to sustain biosynthetic processes. If so, they would be more likely to be dependent on the development of new blood vessels and contain a higher fraction of immature, growth factor-dependent vessels, which would render them more sensitive to treatment with nintedanib. One limitation of this study is that tumour samples have not been collected that would have allowed us to search for molecular markers. However, currently there is no validated biomarker available to predict the efficacy of antiangiogenic compounds. Docetaxel plus nintedanib had a manageable safety profile. The adverse event profile with nintedanib was as expected from phase 1/2 monotherapy and combination studies. 7 8 9 10 Notably, there was a low incidence of class effects typically associated with antiangiogenic agents, such as hypertension, bleeding, perforation, and thromboembolism, which have been noted with other antiangiogenic agents in NSCLC. 35 The recorded pattern of adverse events leading to dose reductions of nintedanib was as expected from previous phase 1 and phase 2 studies in patients with NSCLC. 8 10 The frequency of patients with adverse events leading to dose reductions of docetaxel was in the range of what has been previously reported for docetaxel in the second-line setting. 19 36 The dose intensity of docetaxel was much the same between both groups, suggesting that the addition of nintedanib to docetaxel did not reduce the planned dose of docetaxel. In conclusion, nintedanib plus docetaxel is an effective second-line option for patients with advanced NSCLC previously treated with one line of platinum-based therapy, especially for patients with adenocarcinoma. MR, RK, and BG-M contributed to the conception and design of the study. MR, AM, J-YD, SO, MK, JvP, MG, IB, ML, and SN were involved in the provision of study material or patients or data acquisition. MR, RK, C-NG, JB, and BG-M were involved in data analysis and interpretation. Appendix pp 26–28 list all investigators who participated in the LUME-Lung 1 study. RK, C-NG, JB, and BG-M are employees of Boehringer Ingelheim. RK and BG-M have patents for Boehringer Ingelheim. MR and AM have participated in advisory board meetings for Boehringer Ingelheim. J-YD has received fees from Boehringer Ingelheim for participation in data review or monitoring boards. JvP has received fees for consultancy from Boehringer Ingelheim. SO, MK, MG, IB, ML, and SN declare that they have no conflicts of interest. Funding for this study was provided by Boehringer Ingelheim. We thank all the patients who participated in the study and their families, and all study centre staff. We thank Patricia Glomb for her support in statistical analyses. Medical writing assistance, supported financially by Boehringer Ingelheim, was provided by Aurora O'Brate (Ogilvy Healthworld, London, UK) and Duncan Campbell (GeoMed, Macclesfield, UK) during preparation of this report. 1 J Ferlay, I Soerjomataram, M Ervik, et al. (International Agency for Research on Cancer, Lyon, 2013) GLOBOCAN 2012 v1.0, Cancer Incidence and Mortality Worldwide: IARC CancerBase No. 11. 11 NH Hanna, R Kaiser, RN Sullivan, et al. LUME-Lung 2: a multicenter, randomized, double-blind, phase III study of nintedanib plus pemetrexed versus placebo plus pemetrexed in patients with advanced non-squamous non-small cell lung cancer after failure of first-line chemotherapy. Proc Am Soc Clin Oncol. 2013; abstr 8034. 12 NH Hanna, R Kaiser, K Joo-Hang, et al. Retrospective evaluation of the futility analysis in LUME-Lung 2, a randomised, double-blind, placebo-controlled phase III trial of nintedanib (BIBF 1120) in combination with pemetrexed in NSCLC patients progressing after one prior first-line chemotherapy. Eur J Cancer. 2013;49:3418 (abstr). 15 R Kaiser, JR Barrueco, M Reck, et al. Identification of a clinical biomarker for 2nd line combination with nintedanib in adenocarcinoma non-small cell lung cancer (NSCLC) patients in two phase III trials. Eur J Cancer. 2013;49:3479 (abstr). 18 M Reck, S Novello, A Mellemgaard, et al. Impact of tumor burden on the overall survival analysis of the LUME-Lung 1 study: a randomized, double-blind phase 3 trial of nintedanib (BIBF 1120) + docetaxel in NSCLC patients progressing after first-line chemotherapy. J Thorac Oncol. 2013;8:O16.01 (abstr).